as long as there have been superheroes. But few have achieved the longevity, or appeared in such a variety of venues, as Gilbert Shelton's Wonder Warthog. The Hog of Steel was first published in Help! 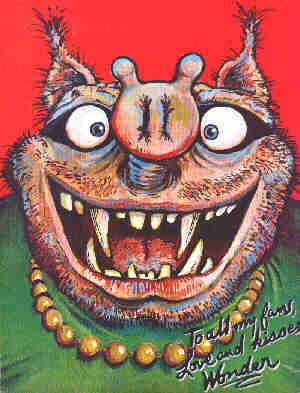 magazine, which is also where R. Crumb's Fritz the Cat got his start. Shortly afterward, he started appearing in Drag Cartoons, Cycle Toons, and other humor magazines aimed at motor hobbyists. (These stories are where it was established that Wonder sometimes rides a Fastass Sumbichi motorcycle.) He also appeared in college humor magazines. In 1967, Millar Publishing brought out two magazine-size issues of Wonder Warthog, the Hog of Steel. That same year, he appeared in a paperback book titled Wonder Warthog, Captain Crud and Other Super Stuff, published by Fawcett Gold Medal. But it was when Shelton moved to San Francisco and got involved in underground comix that Wonder Warthog really started taking off. In between episodes of his most popular stars, The Fabulous Furry Freak Brothers, Shelton continued to turn out an occasional Wonder Warthog story for the undergrounds. In 1973, the entire series to date was gathered together in three issues of (Not Only) The Best of Wonder Warthog. In 1977, Wonder found a regular berth, when Rip Off Press started its anthology title, Rip Off Comix, with him as the cover feature. Today, Shelton's main creative outlet is Not Quite Dead, a comics series about an aging rock band, long available in various European countries but only recently in America. He still finds time for some work on the Freak Brothers, but little or none for Wonder Warthog. Still, many of Wonder's adventures are kept in print by Rip Off Press, and such merchandise as T-shirts and coffee mugs can still be found. Even today, the Hog of Steel is capable of reaching out to new readers. Text ©2000-04 Donald D. Markstein. Art © Gilbert Shelton.